This beautiful object has a complex history. In the center is a gray limestone cobble that eroded from an underwater ridge and rolled free on a shallow coral reef in an area now near Abanilla, southeastern Spain. It was encrusted by a scleractinian coral, which grew thickly all around the cobble because it was turned continually by wave and current action. Larvae of the bivalve Lithophaga landed on the surface of the coral and quickly began to bore downwards, creating the trace fossil Gastrochaenolites torpedo Kelly and Bromley, 1984. They bored in some cases all the way into the cobble nucleus. The whole set was then buried in transgressive sediments of the Los Banós Formation during the Late Miocene. In the summer of 1989, my student Genga Thavi (“Devi”) Nadaraju (’90) found it as part of her Keck Geology Consortium fieldwork for her Independent Study project. It now resides proudly in the trace fossil collection at Wooster. 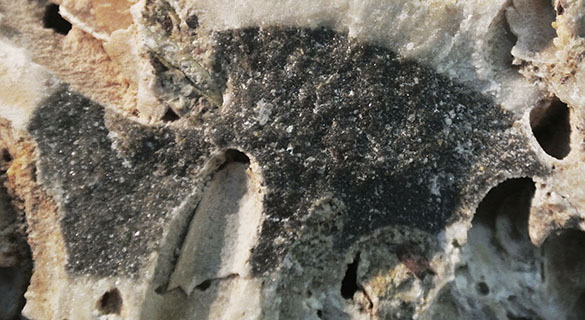 Closer view of the gray limestone cobble in the center. Note the remnants of Lithophaga shells still in the borings. 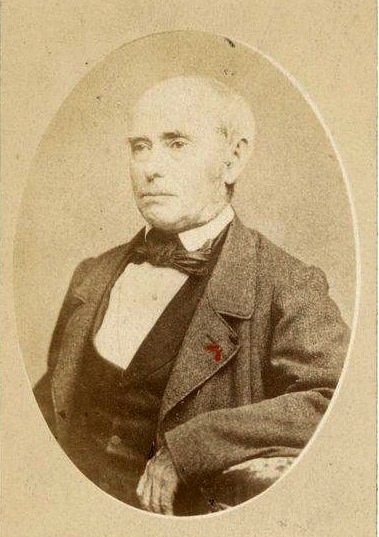 The bivalve boring Gastrochaenolites was named in 1842 by a French geologist with a magnificent name: Alexandre Félix Gustave Achille Leymerie (1801-1878). He was a prolific author with a long career spent primarily studying Cretaceous rocks and fossils in France and northern Spain. Kelly, S.R.A. and Bromley, R.G. 1984. Ichnological nomenclature of clavate borings. Palaeontology 27: 793-807. Leymerie, M.A. 1842. Suite de mémoire sur le terrain Crétacé du département de l’Aube. Mémoire des Société Géologique de France 5: 1-34. Mankiewicz, C. 1995. Response of reef growth to sea-level changes (late Miocene, Fortuna Basin, southeastern Spain). Palaios 10: 322-336. Mankiewicz, C. 1996. The middle to upper Miocene carbonate complex of Níjar, Almería Province, southeastern Spain, in Franseen, E.K., Esteban, M., Ward, W.C., and Rouchy, J.-M., eds., Models for carbonate stratigraphy from Miocene reef complexes of the Mediterranean regions: Tulsa, SEPM (Society for Sedimentary Geology), p. 141-157. Nadaraju, G.T. 1990. 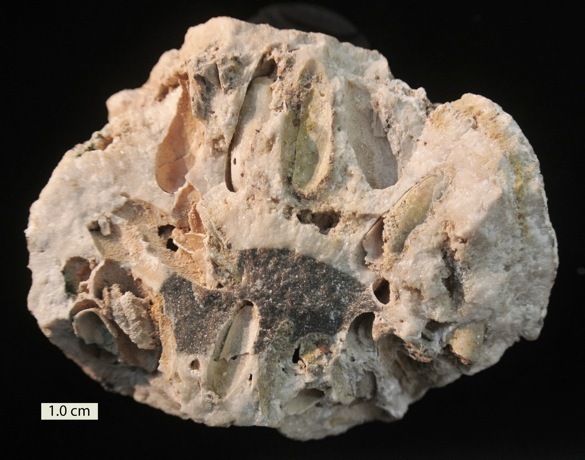 Borings associated with a Miocene coral reef complex, Fortuna basin, southeastern Spain. Third Keck Research Symposium in Geology (Smith College), p. 165-168.